How about a flag subscription for a gift this holiday season? $40.00 will sponsor an American flag for five holiday weekends in 2019: Flag Day, Memorial Day, July 4th, Labor Day, and Veterans Day. Please send a check for $40 made payable to Hopkinton Rotary to PO Box 243, Contoocook, NH 03229. Include the recipient/s' name and mailing address, and we will mail a gift notification. Please include your contact information if you'd like a gift receipt. Or let us know if you'd like the gift notice mailed to you so you can deliver your gift in person! 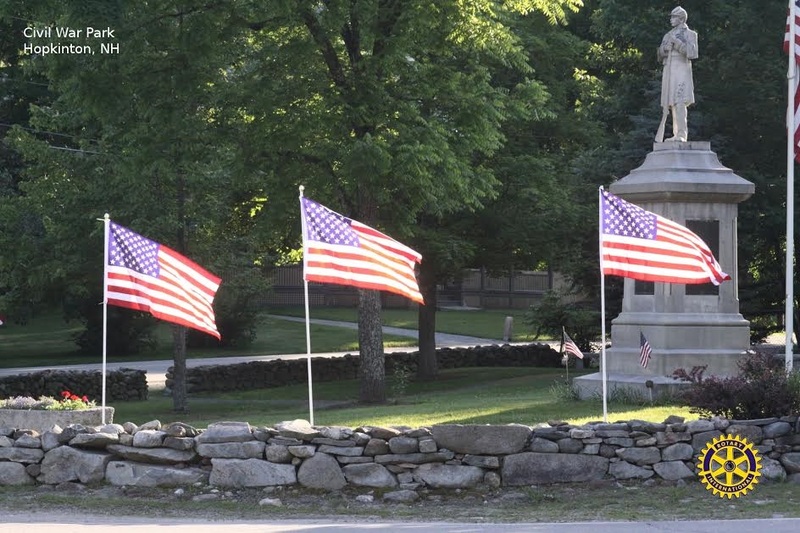 The Flags Above Hopkinton project funds charitable programs and community building activities. Our most recent donation was $4,000 to the Fuel Assistance Fund to help our community neighbor's stay warm this winter. Most recently Hopkinton Rotary donated $4,000 to the Town of Hopkinton's Fuel Assistance Fund. We will also be sponsoring our annual holiday luncheon at the Slusser Senior Center on Wednesday, December 19th. Other recent contributions include the Contoocook Railroad Museum (for the semaphore mast replacement), Choose 2 Reuse (matching funds to help secure grant funding), and Got Lunch? (for lunch supplies and goodies).